Written by TF Staff on 05 December 2012 . MFA Incorporated has been certified by the Safe Feed/Safe Food Certification Program administered by the American Feed Industry Association. Becoming Safe Feed/Safe Food-certified means facilities demonstrate and ensure continuous improvements in delivering safe, wholesome livestock feed for the growth and care of animals. This is a one-of-a-kind, voluntary program that has resulted in the certification of about 330 feed-related facilities. Certified facilities go above and beyond federal requirements to ensure the highest standards in manufacturing and processing are followed each and every day. AFIA’s Safe Feed/Safe Food certification program is open to companies that want to validate a commitment to food safety through proactive leadership. It signifies that qualifying companies have embraced the feed industry’s role in creating feed-based safety programs; they are doing their part to reduce food safety risks; they are participating in an approved risk-management program; and they are aggressively practicing risk reduction. 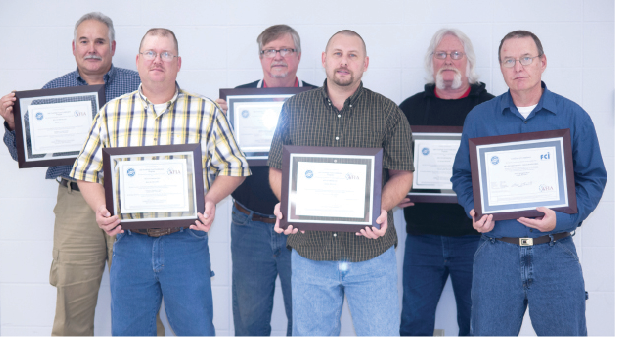 Pictured with certificates for their respective mills are (back row from left) Dennis Buckmaster, plant manager, Aurora feed mill; Gary Cornelison, plant manager, Mexico feed mill; Gary Thompson, plant manager, St. Joseph feed mill. (front row from left) Mark Johnson, plant manager, Kirksville feed mill; Eric Sharp, production supervisor, Lebanon feed mill; Carl Heck, plant manager, Gerald feed mill.